How can political participation be increased? We had the opportunity to listen to four different people who looked at different aspects of British democracy but the speaker I am going to focus on is Areaq Chowdhury who is the founder of WebRoots. In his lecture he focused on political participation, examples of where it has improved, how it is changing, examples of where it is low and possible changes that can be made to increase participation. Firstly, political participation can include a whole range of things from standing for public office to merely voting. It also includes joining pressure groups, picking candidates, voicing your demands by contacting your local MP, writing for newspapers and commenting on articles. This is where the internet has made such a massive impact on political participation. Social media websites such as Twitter has meant that many people who would have struggled to get their views heard before can contribute to online discussions and these websites also make it easier to start online campaigns. 38 Degrees is an example of this where members come together to promote certain campaigns and make a difference. The government also has a website through which you can petition Parliament. After 10,000 signatures petitions get a response from the government and after 100,000 signatures petitions are considered for debate in Parliament. Some people argue that this is evidence that political participation has not decreased and is merely changing. Others, however, point to recent elections which show that political participation in the form of voting is still a major issue in UK politics. The main reason that this is such an issue is because if elected officials are not voted into office with a high voter turnout then their mandate to govern is brought into question. Recent police commissioner elections have seen some of the worst voter turnouts. In Gwent (2012) the turnout was just 14.3 per cent overall and one polling station in Newport was visited by no voters at all. Areaq Chowdhury also talked about the 2010 Conservative Liberal Democrat coalition and the questions surrounding its legitimacy and mandate. No one voted for the joint rule of these two parties and so they lacked a mandate. One way that some people suggest voter turnout may be increased is through the increased use of referendums. This form of direct democracy allows people to have a real impact on the eventual decisions and the argument is that people will therefore be more likely to vote unlike in general elections where they are only picking representatives. However, some referendums have received shockingly low turnouts. For example, the 2011 AV referendum vote received a voter turnout of just 42.2 per cent. This is opposed to the 84.6 per cent voter turnout at the Scottish independence referendum. This shows us that the extent to which people engage with referendums relies heavily on the issue. Other ideas which have been suggested which could possibly increase political participation include lowering the voting age to 16. People argue that this, combined with increased education, would result in higher turnouts because young people would feel as though they have been given more responsibility as well as being more engaged in issues that they understand. Also, online voting for elections and minor referendums to explain to MPs how to vote in certain situations have also been proposed. Although there are security fears concerning the former and the influence of party whips on important and polarising issues would affect the latter. I have always wondered why scandals are named using the suffix ‘-gate’ – think ‘Plebgate’, ‘Hackgate’ or ‘Bloodgate’. It turns out that the reason stems from Watergate – a scandal that changed American politics and the public’s faith in the president forever. In May 1972, five men connected with Nixon’s re-election campaign broke into the Democratic National Committee Office in the Watergate building and attempted to tap phones and steal top-secret documents. They were guided by two men from Nixon’s White House in the building opposite by walkie-talkies. The wiretaps failed and so they returned on the 17th June when they were arrested. It was not clear that they were connected to the re-election campaign. A spokesman for the White House, when asked about the event a few days later, said that he would not comment on ‘a third-rate burglary’. Two reporters, Carl Bernstein and Bob Woodward began to investigate the crime. They, on the other hand, thought that this was ‘a professional type operation’ as the burglars wore surgical gloves and carried thousands of dollars in cash. Now, they are given much credit for exposing the President’s involvement. At first, Nixon went to great lengths to attempt to cover up the crime: he tried to persuade the CIA to stop the FBI from investigating, evidence was destroyed, staff members who refused to cooperate were fired and it was arranged that the burglars would be given hundreds of thousands of dollars to keep quiet. In August of that year, Nixon gave a speech in which he claimed that he nor his staff were at all involved with the break-in, but FBI agents discovered in October that the break-in was linked to Nixon’s re-election campaign. $25,000 for the campaign was found in the bank account of one of the burglars. However, he was re-elected as President that November taking more than 60% of the vote. Hearings surrounding the case began in 1973. Alexander Butterfield, former appointments secretary to the President, testified that Nixon had secretly taped every conversation that took place in the Oval Office since 1971. Prosecutors were determined to get hold of the tapes as they would provide solid evidence to prove Nixon’s guilt. Archibald Cox, the assigned special prosecutor for this case, was fired by Nixon when he refused to stop demanding the tapes. Several Justice Department officials resigned in protest at this decision on the 20th October 1973. This later became known as the Saturday Night Massacre. Eventually, Nixon agreed to hand over written summaries of the tapes, but the White House couldn’t explain why there was an 18 and a half minute gap in one of them. 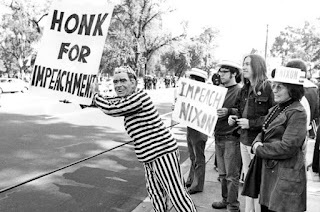 During a speech the following month, Nixon says: ‘I’m not a crook,’ maintaining his innocence. Amid calls for impeachment, he insisted that he would stay in office, despite increasing unpopularity. He asserted that he had made mistakes but broken no laws and would not release the tapes, as they could harm some of his senior staff members. He also claimed that he had not known of the burglary or the cover-up until early 1973. On March 1st 1974, seven of Nixon’s former aides were accused of charges related to the Watergate break-in. Nixon was called an ‘unindicted co-conspirator’ by the jury as they were unsure as to whether they were able to accuse the current president. The Supreme Court ordered Nixon to hand over the original copies of the tapes in July 1974, despite his pleas for presidential privilege. Meanwhile, the House of Representatives voted to impeach him for obstruction of justice, abuse of power, criminal cover-up and several violations of the constitution. The tapes were released on August 5th, proving without a doubt his complicity in the Watergate crimes. One conversation especially, from June 23rd 1972, showed that Nixon had played a leading role in the cover-up. Facing certain impeachment from the Senate, Nixon resigned on August 8th, becoming the first US president ever to do so. Nixon’s resignation was only right and really came too late. This scandal led to further distrust of the government at a time when they were already divisive due to the Vietnam War. Had he admitted his crimes straight away rather than devising elaborate plans to cover them up, then the whole political system would not have been tainted with him. Greater openness and honesty was subsequently demanded of American politics by the people and this was met by several reforms.